Since we're already talking about street art.. check out this guy..
How cool is that? Not 100% sure who the artist is, so if you know I would love for you to let me know! I used Lucky 200 ISO film and a random Hanimex camera I picked up at an op shop for $2. 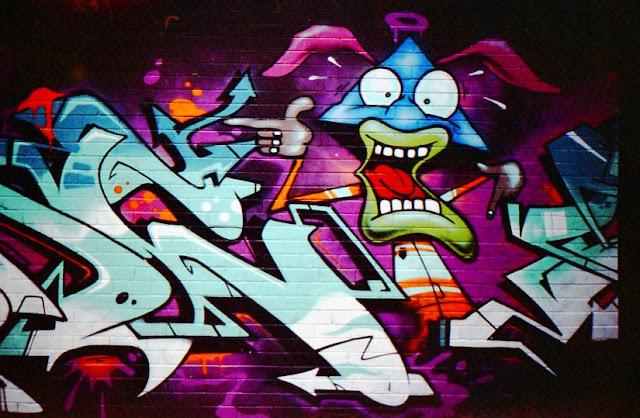 I love the way this film picks up the colours of street art (I have used the same for my previous posts on street art and grafitti). COOL UPDATE: So, since I put this post up I got an email from Si at Verb Syndicate - you know those awesome peeps that bring us Wonderwalls (yes, that is a link and you should check it out). Well, Si let me know that it was through Wonderwalls that we got Sydney street artist, Pudl, to come down and give us this gem. Like Pudl? Click through to his blog here!